The sailor sessions are a collection of 8 tracks that were recorded by Babyshambles in July 2003. Because the line-up of Peter Doherty's new project has been changed so much to the present day, it is actually a whole different band to the one we now know as "Babyshambles" (Peter Doherty/Mik Whitnall/Drew McConnell/Adam Falkner). The band recorded six tracks and phoned fan and friend Dean Fragile (owner of the "Tap 'n' Tin") to ask him to mix them, despite no prior experience. Dean sat with the instruction manual of the recorder and mixed it (“They were pretty awful sessions – or at least the other musicians were, I basically eliminated everything except Peter and his guitar”). This was where the first six tracks of the session came from. The remaining two (Hooligans on E and What Katie Did) were added onto the session as a bonus. Although most songs went on to be recorded by The Libertines for their second, self-titled album, Hooligans on E didn't. This track was given by Doherty to his girlfriend at the time, Lisa Moorish, to record with her current band, Kill City. Kill City released "Hooligans on E" as a single in 2004. 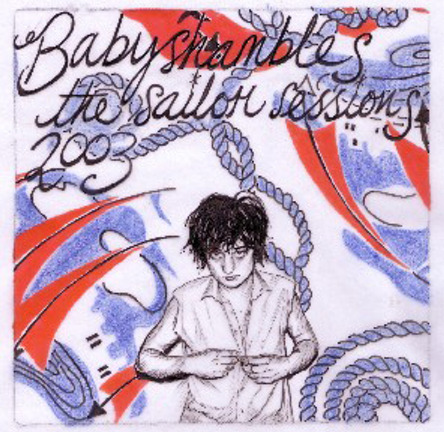 The artwork for the sailor sessions was produced by Sophie Thunders, who has also made other artwork for both Babyshambles and The Libertines. The title for the session was dubbed by Dean Fragile mainly because his hometown was Chatham in Kent; a naval port.